Alright, I said, if I’m gonna make this book about traditional dress in Oaxaca, first thing I need to do is figure out the scope of the project. Oaxaca is big and broad and deep. How many villages are out there where people dress traditionally? That will tell me how long I’ll be travelling, roughly how many portraits I’ll be taking and about how little or how much of my life this will consume. Who do go to for the answer? Well, I figured I was a great place to start. After all, I’ve lived here twenty odd years, have made a point of learning about traditional textiles and run a tour business proud of offering trips to the fascinating textile villages of remote Oaxaca. I’ve spent long, long hours traveling to those villages to learn about them and create the tours. Indeed, if I didn’t feel like I had at least a decent sense of the scope of it all, I wouldn’t have dreamed up this idea in the first place. In other words, I ought to know. 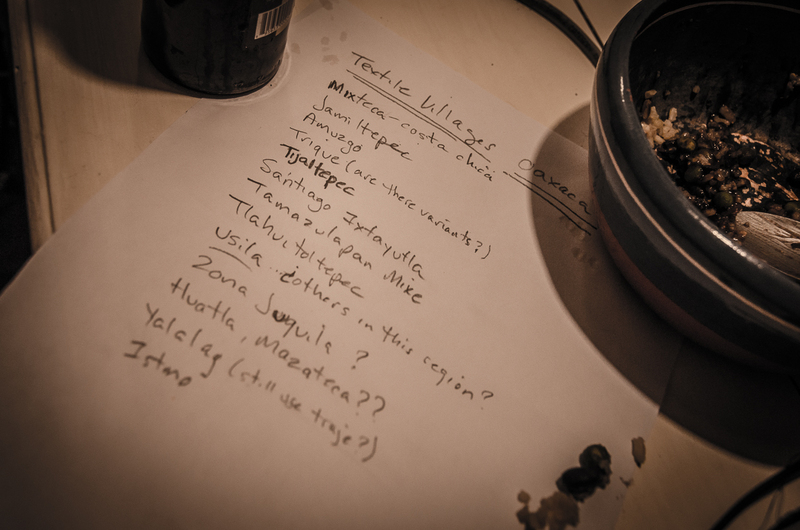 So I sat down and made a list of every village I could think of in Oaxaca that had traditional dress. Several of them I knew well, had visited many times. Others I only knew of through legend, old photos or hearsay. I wrote names, scratched my head, walked around a bit to see if something would come to mind I hadn’t thought of, and then did it all again. “All” the Oaxacan Textile villages. When it was all said and done, I had 13 names. However, I thought, there were probably more, because some of those names I had where based on vague knowledge. Usila, for example, for all I knew the tradition didn’t exist there any more…or maybe it did and there were other villages in the area with dress as well. Like Usila I had several examples…maybe there was, maybe there wasn’t, maybe there were more than I knew of in that region. So in the end, doing the kind of math that my mind does using complex algorithms, hypothesis and artistic delusional equations I came up with the number 15. Fifteen. 15! That’s how many villages in Oaxaca have traditional dress. Now, if in each village I make 5 portraits I’ll have 75 portraits. A fabulous body of work. And if it takes me 4 days to make those portraits in each village (including travel time) it will take me two months of field work to get this project photographed. A big time commitment, but achievable. With this solid bit of knowledge stored away, I prepared for the job. And in the mean time I consulted some other friends who also knew about textiles in Oaxaca pretty well. Between them they came up with the same list I’d worked up, plus two more villages. Suddenly it was 17. And then I headed into Mixes to photograph the two villages I knew about there. And once there I asked people if there were others. Yes, yes of course, they said, and they named five more villages. Five more! 22 villages!! Goodness! Maybe I didn’t know as much as I thought I did! Then I happened to met a woman who knew the Usila region (Papaloapan) quite well. Yes, she said, there is still traditional dress in Usila. And she went on to name a long list of other villages in the region with traditional dress as well. Eight more! Thirty villages! Wait, wait, wait! What have I committed too? I’ m gonna eat some humble pie and make a long story short, trying to keep the word count of this blog under 1,000 because I know you’ve got lots of other things to do. Between one thing and another, not the least of which was the publication of an insane map earlier this year by the Museo Textile de Oaxaca (in which they show every known village in Oaxaca with a textile tradition that once existed, currently exists or currently may or may not exist [because no one in our urban realm really knows in a lot of cases])…between one thing and another that list is now hovering around 65 villages and/or style regions. There is so much more out there than I’d ever imagined! Clearly, I had no idea! How exciting to learn that the world of textiles in Oaxaca is a magnitude greater than I thought. But how on earth am I going to photograph in so many villages? It’s an author’s privilege and responsibility to curate. New meaning for “It take a village” to discover 65 textile traditions in Oaxaca. And Yes I do love the blog length!